BRANTFORD – Fifty years after his book Unsafe at any Speed launched the modern consumer advocacy movement, Ralph Nader continues as a prolific and powerful voice in contemporary culture. The political activist, author, and perennial U.S. presidential candidate will deliver a lecture on Corporate Wrongdoing at Wilfrid Laurier University’s Brantford campus. The event takes place on Wednesday, Nov. 16 at 7p.m. at the Sanderson Centre for the Performing Arts. The lecture is open to all and admission is free thanks to sponsorship by the Criminology Students’ Association and support from the Laurier Brantford grants program. 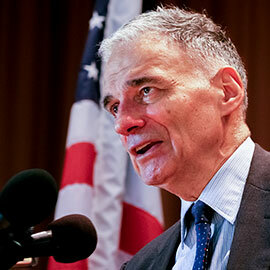 Nader’s influence on the realms of consumer protection and environmentalism is vast. Named one of The Atlantic’s hundred most influential figures in human history, Nader was instrumental in founding scores of citizen groups as well as establishing watchdog agencies including the Occupational Health and Safety Administration and the US Environmental Protection Agency. In his dozens of books since his 1965 debut, Nader works to educate and empower consumers. His latest release, Breaking Through Power, is an inspiring look at American citizens who have organized and waged successful fights against big business and corporate privilege. The book is a reminder from Nader to readers about how crucial and powerful democracy is. The lecture begins at 7 p.m. At 8:30 p.m. there will be a brief question & answer session, followed by a book signing. Tickets can be obtained at the Sanderson Centre box office at no charge. Tickets are available from the Sanderson Centre online or by phone; however, a $4.99 service fee will be applicable. In the Waterloo area, tickets can be obtained from the Wilfrid Laurier University U-desk, located in the Fred Nichols Campus Centre.